Synopsis: Born of the fallout from mythic wars fought among the Grecian gods and their mortal worshippers, Diana, warrior princess of the Amazon island nation of Themyscira, bursts into the modern world both as ambassador of her people and selfless protector of the innocent. And in so doing, she collides with the ignorance and imbalances of the twenty-first century, battling injustice as Wonder Woman. But even with skills and abilities to rival those of her Olympian namesake, Diana is put to the supreme test as the horrors of the ancient past rise again to wreak havoc upon the world. Now her indomitable will and astounding powers are pitted against the patient and all-encompassing malice of the War God Ares, who feeds on the strife created by humanity's propensity to turn against itself. Over the holidays, I finished S.D. Perry & Britta Dennison's novelization of Warner Premiere's animated Wonder Woman movie, based on the screenplay by Michael Jelenic (with uncredited story assistance from DC's Gail Simone). I will attempt to form my thoughts and impressions into a (hopefully) coherent review. SPOILER WARNING: Here there be spoilers. The first thing to note is Adam Hughes' cover for the paperback, which you can view above. It is unusually subdued, yet--I think--effective. 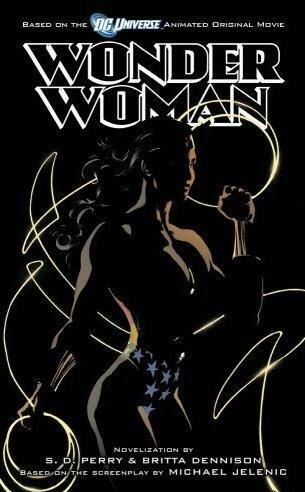 The image is a profile view of Wonder Woman, almost in black-and-white (previously used as the cover for Wonder Woman issue 188, March 2003) . It's as though publisher Pocket Star Books was afraid of making the cover too gaudy. I don't think that I would want the piece as a poster, but it makes for an interesting cover. The novel, itself, begins in ancient Greece nearly five thousand years ago. The Amazons are in rebellion against the forces of Ares, the Greek god of war, who takes the place of Heracles/Hercules in this version of the Amazons' history. Here, it was Ares who seduced the Amazon queen Hippolyta and tricked the Amazons into slavery (forcing Hippolyta to bear him a son, the monstrous Thrax, along the way). We meet many of the key players in this chapter, especially the Amazons Artemis, her sister Alexa, and Persephone (who is horribly wounded by Ares' son Phobos). The story quickly moves from the Amazons' victory to present day Themyscira, where we are introduced to the twenty-something Princess Diana and (eventually) USAF Col. Steve Trevor, who crashes on the island after an aerial dogfight with unnamed hostiles over the Aegean Sea. Events soon spin out of control as Steve flees for his life from pursuit from Amazon warriors, only to be brought to heel by Diana and brought before the queen. The imprisoned Ares uses the distraction to put his own plans into action; escaping with the help of a surprise ally. By the time the Amazons are aware of Ares' escape, the Champion meant to return Col. Trevor to Patriarch's World has already been chosen (Diana, of course). Diana now has an additional mission--to track down Ares and put a stop to his plans. The remainder of the book includes Diana's encounters in, and impressions of, Man's World, her developing feelings for Steve, and their attempts to find Ares while surviving the attacks of his minions--all leading up to a final, grand battle that should prove satisfying to most readers. I enjoyed the novel immensely. Jelenic, Perry and Dennison borrow from several versions of Wonder Woman's history (the book's authoresses opted to make Hippolyta a blond in tribute to her golden-age appearance, although she is raven-haired in the animated film), but manage to blend them together into a satisfying whole. Most of the familiar elements are here: The red, blue and gold costume, the Lasso of Truth, the invisible jet and, yes, the tiara that Wonder Woman also uses as a weapon.Some of Steve Trevor's dialogue is awkward (almost cringe-worthy), but he is depicted as a slightly-flawed man who strives to be better. Diana is certainly much more naive than her Amazon sisters, but she is not a complete innocent and she handles herself surprisingly well in Man's World. The story focuses on the most physical manifestations of Diana's powers. No, she doesn't seem to possess the ability to fly (that we see), but she proves to be an expert pilot for the invisible jet (a product of Lansanarian technology, gifted to the Amazons). Her strength is equal to the adversaries she encounters, but is not up to the Superman-like levels that she displays in the comics. And, yes, she is fast enough to deflect bullets with her Amazon bracelets. I'm not sure if the final passages of the book are actually part of the movie, or something added by the novel's authoresses. However, at least it finally gives someone in the book the opportunity to actually call Diana by the name Wonder Woman. I will admit to some quibbles. One of Steve Trevor's wing men is described with the Air Force rank of staff sergeant--an easily corrected factual error. U.S. military fighter pilots are all commissioned officers; an NCO would not be flying a fighter jet or a bomber. Similarly, "air force" should be capitalized when specifically writing about the USAF. The abilities of the Amazons seem to be a bit uneven. They all seem to be nearly as fast and as powerful as Diana, and hold their own against a number of mythical monsters, yet they are often felled by relatively ordinary men who happen to serve Ares. If Diana is supposed to have any additional abilities that were granted to her by the gods, it would be nice to show it; as it is, I have to assume that what we see is what we get. None of this seriously hampered my enjoyment of the book. I give the Wonder Woman novelization an "A." Recommended.